War is nasty business, there’s no doubt about that. PFC Aaron Fairbairn and millions of have given their lives in military service to the United States of America. On this day, November 11th, every year, we honor those who have served in the various branches of the United States military. We honor veterans because they have the nerve to man-up and be willing to make the ultimate sacrifice on our behalf. Most are not called upon to give their lives in service, but you would be surprised to learn that there are many other casualties of military service than those who are killed in battle. Many suffer non-fatal injuries, experience extreme stress and trauma which may be associated with military service which could lead to a decline of the immune system, physical and psychological health, and shortened lifespan. Military service does take its toll on those who serve, and we are blessed by their volunteering to serve on our behalf. You might be surprised to know that 22 veterans take their own lives every day. It makes you think there’s something not quite right about this. These people have really gone the extra mile for us, and for them to represent a large demographic of those who commit suicide every day in the USA, indicates a serious problem. These are our heroes, the ones who have volunteered to stand in the gap for us. We are forever in their debt. We owe them, yet, in many cases, they feel lost, forgotten, or left suffering. Even though we honor them often, especially on Veterans Day, in our hearts and minds, and honor their service by telling stories of their service, and proudly display their photos in uniform, they are not feeling as well as they could. Interestingly, November 11th kicks off the holiday season; a time of year when those who feel good feel even better, and those who are not feeling well can feel far worse. So bad, in fact, that this time of year represents not only the season to celebrate joy, and spread goodwill, but also the time of year when suicides are far more prevalent. The most popular of days to commit suicide are December 25th, January 1st, (and followed by July 4th). This year, I hope that you will join us in sending love and expressing gratitude for veterans, their service, and others in our communities and around the world. 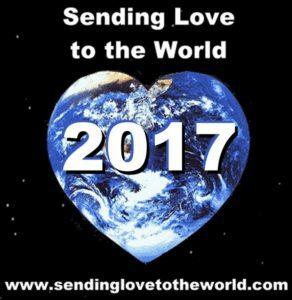 Veterans and non-veterans can join us for Sending Love to the World, which starts today and runs throughout the months of November and December, ending on January 1st. Of course, you can send love to the world at any time, some will elect to send love for 10 minutes or more from one day to every day throughout the season, but it is our hope that you would be willing to join us for a minimum of three minutes to send love to the world this holiday season in any manner which suits you best. You could pray, meditate, go to church, light a candle, whatever feels right for you. Every little bit helps, as it has a cumulative effect at a time when people might be feeling that the pain of living life might be worse than having no feeling at all. Plus, you get the benefits of sending love to the world. Three minutes of sending love fill you and your heart with love, increasing healing and feel good hormones that increase and strengthen your immune system for up to eight hours. All from as few as three minutes of sending love to the world. If you are not sure how to send love to the world, here is a free Sending Love to the World guided meditation video you could use at any time. Please share and invite others to join us in sending love to veterans and the world this holiday season. Much gratitude and love to all veterans who have served and sacrificed. 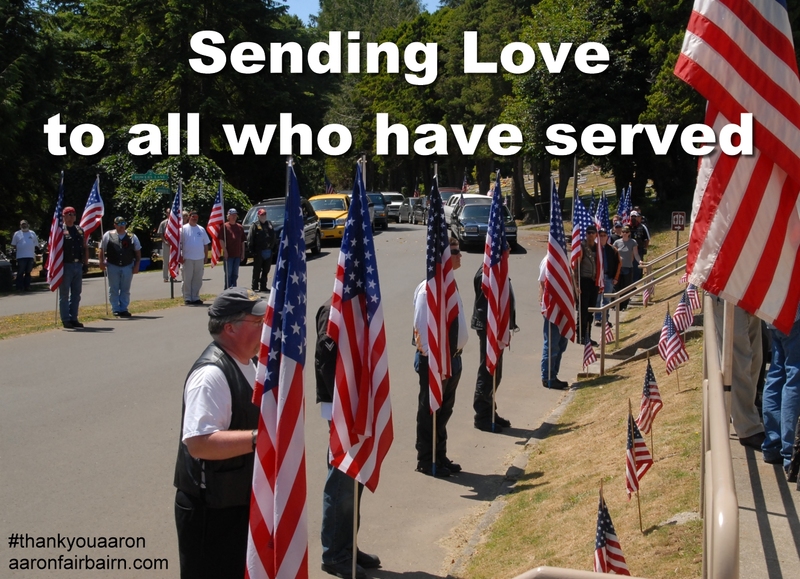 Honoring your service, sending love to you and yours every day. God bless you for all you have done and continue to do. This entry was posted in Veterans Day and tagged military service, sending love to the world, veterans day, veterans suicides on November 12, 2017 by aaronfairbairn.